'Lenny': Debian for the masses? Review The venerable Debian Linux distribution has experienced a significant new release with its latest update, dubbed Lenny. While Debian is still not the easiest Linux distro to install and use, Lenny makes significant leaps forward and remains one of the most powerful Linux options. Many Linux newcomers stick with popular distros like Ubuntu or Fedora and feel intimidated by the likes of Debian. 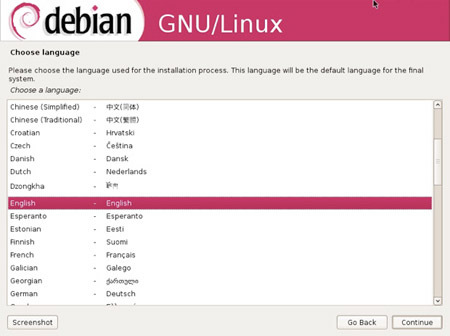 As Linux evangelist Mark Pilgrim once quipped, Ubuntu "is an ancient African word meaning 'can't install Debian'". But Ubuntu is a Debian derivative. And Debian's reputation for being difficult isn't nearly as deserved used to be, so if you've found Ubuntu getting in your way, the latest Debian release is worth a look - Lenny even offers a graphical installer - which actually arrived with the previous release, called Etch. Still, Debian's main audience is made up of hard-core Linux users and server admins, many of whom scoff at Ubuntu's decision to "dumb down" Linux and remove - or make it difficult to - tweak the distro to suit their whims. Debian, on the other hand, prizes personalization and customization, not ease-of-use. And fear not, Lenny still offers the advanced shell-based install with its myriad of options and packages, as well as all sorts of CLI-only configuration tweaks. Lenny was released this weekend, but for review purposes, we used the "testing" version (beta 2), and we did not encounter any significant bugs. Of course, that doesn't mean Debian is a pain-free install. In fact, if you're looking for something that just works, better to stick with Ubuntu. But if you want something that just works your way, and you don't mind a little bit of pain to get there, then read on because the latest version of Debian delivers. Among the new features in Debian's Lenny release are upgraded desktops, the latest version of X.org, IPv6 support, and more. Debian ships in GNOME, KDE, and XFCE desktop flavors. The default option is GNOME 2.22. Although the GNOME development team has already moved on to GNOME 2.24, the Debian team has decided to play it conservative and stick with GNOME 2.22. Unfortunately, that means you'll miss out on some nice features, like tabbed windows in the Nautilus file browser. The Debian release notes tout native Flash support through the swfdec-gnome codecs (which, unlike Adobe's Flash plugin, are not proprietary), but we had some trouble getting them to work. Of course, you can always add the debian-multimedia.org repository to Apt's repository list and grab all the multimedia codecs you need - Flash, MP3 and more. While Debian may be playing it safe with GNOME, it has opted for the latest stable release of X.org - version 7.3. The latest X.org brings some nice new features like hot-swappable support for input devices such as mice and keyboard and enhanced support for touch screens and tablets. Debian is perhaps best known as a server operating system, and Lenny has plenty of upgrades for those looking to deploy a Debian server. The server version of Lenny now features MySQL 5.1, PostgreSQL 8.3, webmail IMP 4.2, and more. Also worth noting in the server release is that Debian has dropped support for Apache 1.x and moved to Apache 2. Debian has always been the ultimate in customization, with the full span of options running to no less than five DVDs - or if you prefer, some 30 CDs. Lenny continues that trend with an everything-and-the-kitchen-sink approach, however, to get the basic system installed you only need one DVD.